EVRYTHNG became a GS1 US Solution Partner a few months ago, as we excitedly announced in a blog post at the time. This news may have made you wonder: Who exactly is GS1 and what does this have to do with the Internet of Things? We’ll be explaining what this all means in a series of blog posts over the coming weeks. GS1 is a standards organization that facilitates industry collaboration to help improve supply chain visibility and efficiency through the use of GS1 Standards. It’s the most widely-used supply chain standards system in the world. The organization was launched in 1974, a few years after a disruptive technology appeared on the market: the barcode. GS1’s mission was—and still is—to improve supply chain efficiency and help members grow. Over the years, it has evolved from core barcode standards into a language that supports the identification, capture and sharing of critical business information at every step of the commerce journey. 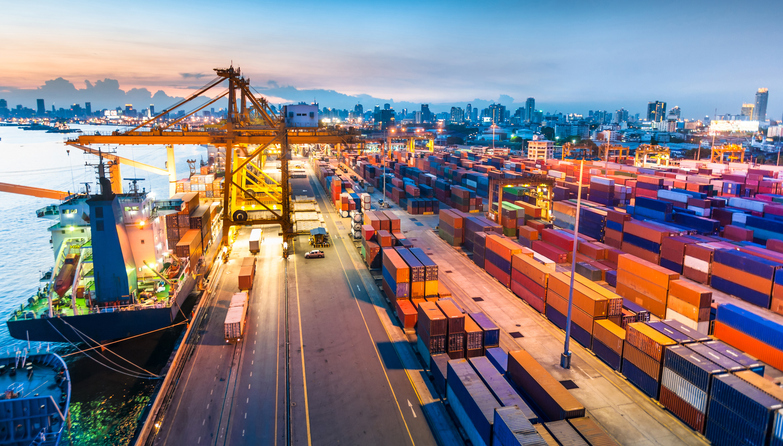 It’s important to note that the term “Internet of Things” and many of its foundational ideas came out of joint research between GS1 and the MIT Auto-ID Labs that began in 1999 when researchers were looking for a term to describe the vision of global networks of tagged goods. Today, GS1 serves more than two million companies in more than 25 sectors (in particular consumer packaged goods, apparel, healthcare and foodservice), across 150 countries and is organized through 112 regional organizations that distribute identifiers and promote product identification standards among their members. GS1 identifiers are scanned more often every day across the globe than the number of searches on Google (5 billion +). The massive worldwide adoption of GS1 standards is why EVRYTHNG’s status as a solution partner matters: It means that businesses using GS1 standards (almost every business selling or producing goods) can now take their products to the next level by connecting them to the web and making them smart. A deep dive into all of the standards GS1 manages would make this blog post rather difficult to digest, so let’s first focus on a number of the most important GS1 Standards. (We’ll dig more deeply in upcoming blogs.) As shown below, GS1 Standards cover three broad categories: identifying, capturing and sharing. Figure 1: GS1 System of Standards from identification to capturing and exchanging data along the supply chain. Identification is the core of GS1’s story. GS1 identifiers can address several things, including locations and services, but most important, they identify products. There are two major categories of GS1 product identifiers: GTIN (Global Trade Item Number) and SGTIN (Serialized Global Trade Item Number). A GTIN identifies a company as well as a type of product, whereas a SGTIN identifies a specific instance of a product. GS1 not only standardizes these identifiers, it also licenses them to businesses. Companies license the exclusive right to use ranges of identifiers from their GS1 regional office so that GS1 IDs are managed uniquely on a worldwide scale. Next up is capturing. GS1 standardizes the way identifiers are encoded in ‘data carriers’ and captured by readers. These carriers can take many forms, such as a barcode like the EAN (European Article Number) and U.P.C. (Universal Product Code), which appear on most products around the world. EANs and U.P.C.s are both GTINs represented in barcode form. GTINs and other GS1 identifiers may also be serialized in accordance with GS1 Standards—for finer identification granularity. For instance, the GS1-128 barcode has enough capacity to contain a unique number for an item as well as other information about the product. Additionally, with the EPC (Electronic Product Code), GS1 also provides a construct to write and read these unique identifiers in RFID tags. The tags communicate their identifiers via (standardized) radio protocols (UHF) and, unlike barcodes, can be read from a distance without line of sight. 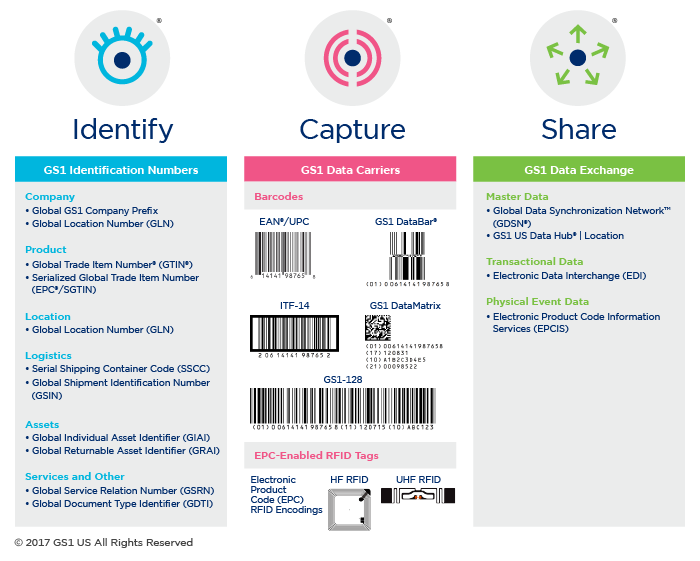 Last but not least, GS1 provides a number of standards for sharing data from and about these identifiers encoded in different types of carriers. 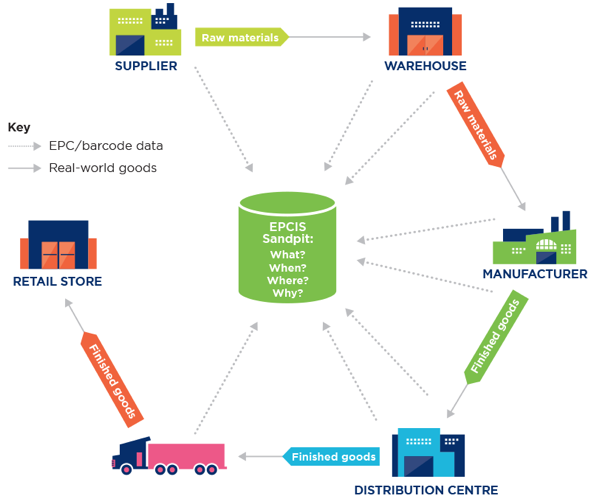 This is where standards like EPCIS (Electronic Product Code Information Services) help: They define a standardized information format for describing and sharing events within the supply chain, recording the what, when, where and why of an event. For example, an EPCIS event can record that a pallet is composed of several items and that it was seen at Gate E of a distribution center at a particular time. GS1’s most recent standard demonstrates its evolving focus on data: GS1 SmartSearch is a standard using semantic web technologies to describe the metadata of products. Concretely this means that it can describe products in a standard way that machines can understand so that, for example, search engines know what a product is and therefore can deliver better search results. Another good way of grasping the breadth and potential of GS1 Standards is to have a look at its interactive journey page, where you can see the use of standards following a product along the supply chain. If you are familiar with EVRYTHNG, you probably understand that we share the value of GS1’s vision. 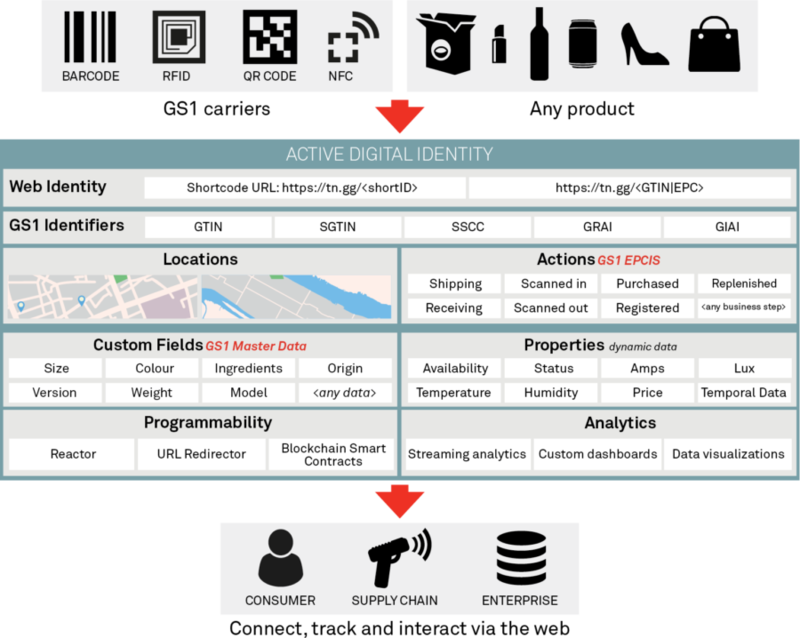 EVRYTHNG is all about giving products a digital identity on the web and powering applications across the product lifecycle, which include supply chain, direct-to-consumer and connected products solutions. Identification standards: While we generate item-level and unique IDs for products, we are not fussed about our customers using our IDs. What we really want is for all “thngs” to have unique IDs, regardless of who generated them, because this helps unlock their digital value. Thngs, Products and Collections can be addressed using any identifier, including GS1 GTINs. Capture standards: EVRYTHNG is carrier agnostic and supports 1D barcodes (e.g. EAN, UPC, GS1-128), 2D barcodes (QR, GS1 DataMatrix), NFC tags and UHF RFID tags (e.g., EPC Gen2). We support these formats through our platform but also through our SDKs such as SCANTHNG. Sharing standards: EVRYTHNG supports EPCIS through our Action Types mechanism. This enables the ability to capture events from and about products using the EPCIS vocabulary and the structure of EPCIS events, allowing for better data interoperability. We also support the new GS1 SmartSearch via our custom fields mechanism, allowing the addition of standard metadata to Thngs and Products. The semantic web is an area where our innovation team is developing new tools, so stay tuned for better support of GS1 SmartSearch. Figure 4: The lifecycle benefits of combining GS1 Standards and EVRYTHNG. Today, EVRYTHNG is one of the few fully managed Platform-as-a-Service implementations of GS1 Standards. By leveraging this position, we aim to join GS1 in the push to extend the reach of GS1 Standards far beyond the supply chain. This means that while brands and businesses can keep using the standards they worked hard to put in place, they can also benefit from the innovation EVRYTHNG offers and work to future-proof their smart products efforts. 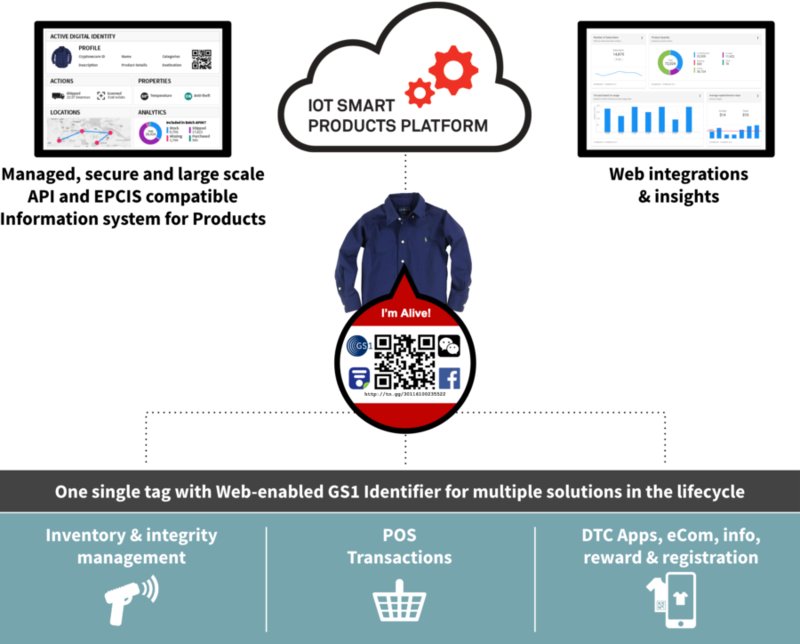 GS1+EVRYTHNG means that products not only get an identifier that can be used for supply chain tracking, they also get a standard web-enabled identity that can be used to serve many applications—from inventory tracking and product authenticity, to mobile payments and direct-to-consumer marketing applications. Thanks to EVRYTHNG’s Web of Things framework, products become first-class citizens of the web with a secure web API that can be used to integrate them into any web application, experience or analytics system.